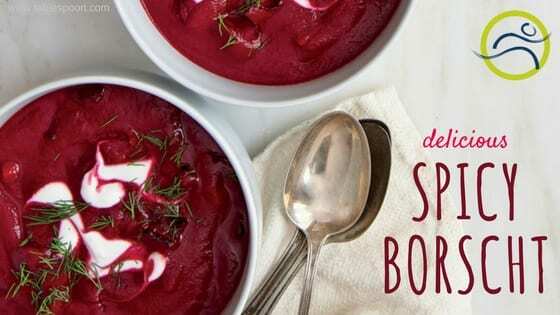 A classic Eastern European soup with a seriously spicy kick. Peel and dice the onions, carrots, celery, parsnips, and beets so they are all roughly in a 1/4 inch dice. In a large sturdy pot, add oil over medium heat and then add all the veggies that you diced. Let them cook over medium heat for 8-10 minutes until they start to soften. Make a well in the center of the pot and add a small drizzle of extra oil if the pan is really dry. Add all your spices and cook for 30 seconds. If you want the soup VERY spicy, add the dried habanero. Otherwise, leave it out. Add water and bring to a simmer. Cover and simmer the soup for 8-10 minutes until veggies are tender. Add in sliced cabbage to the soup and continue to simmer until it softens. Add apple cider vinegar and season with salt and pepper. If the soup is very thick, feel free to add another cup of water. 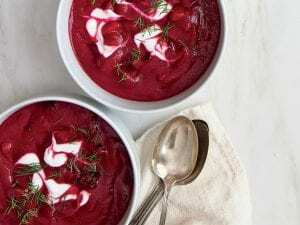 Remove dried chili if you used it and serve soup immediately garnished with a big dollop of Greek yogurt and fresh dill!